I'm working on the application form for the apprenticeships exemplar for NAS. As we've been researching and prototyping the service we've seen that a part of the form users find difficult is where they input the details of their previous jobs. In particular, the start and end dates of those jobs. The majority of our users have just left school or college, often their previous work experience has been quite informal or they don't have paperwork to hand. 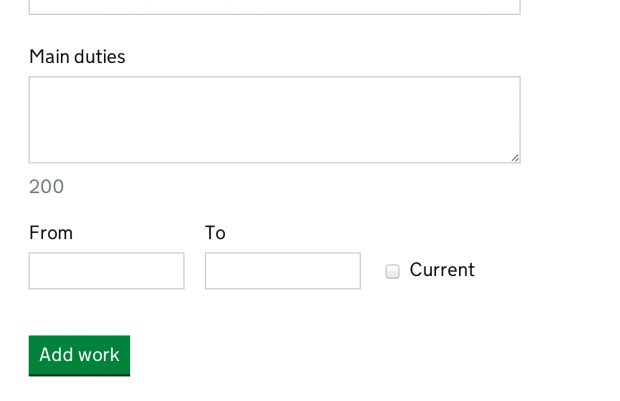 When we investigated the user need for this form input, we found that most employers just want to know the approximate duration of the candidate's work experience and how long ago it was. So we prototyped an interface that gathered enough detail for the employers, but with enough affordance that applicants would find it easy to complete. We tested having a "From" and "To" input with users and found that it tested well. They could enter a date, month, year or "2 weeks", we didn’t want to constrain what they entered. The prototype worked great, but for the timebeing the apprenticeships exemplar needs to integrate into a legacy database. After talking our prototype through with the guys in charge of the legacy database we found that our interface wouldn’t be possible because the database has start and end dates as required fields. This is why the old application form used a complicated date picker for each input. We then looked at where these dates were actually displayed within the application process, and we found something interesting. The dates were only ever shown as a month and year, the system was completely ignoring the day part of the date. 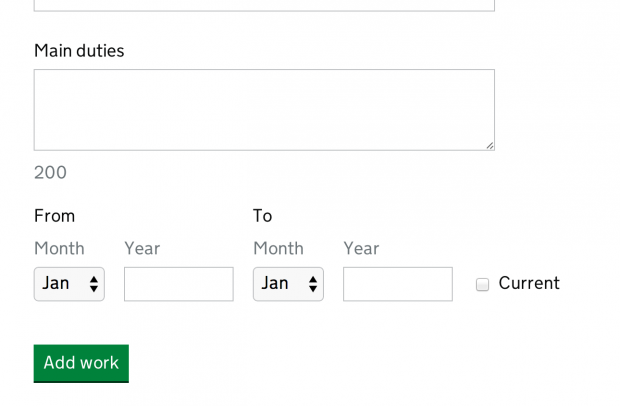 Having discovered that the "required" day field isn't actually being used, we designed the input so the user only needs to select a month and type in the year. We automatically complete the day field with a placeholder number so it can be stored in the legacy database as “01/07/2014” and displayed to employers as it is currently “July 2014”. We’ve compromised on our ideal solution, but we've still improved this area of the user experience. And in a few months when the legacy database is retired we'll be able to iterate it further.